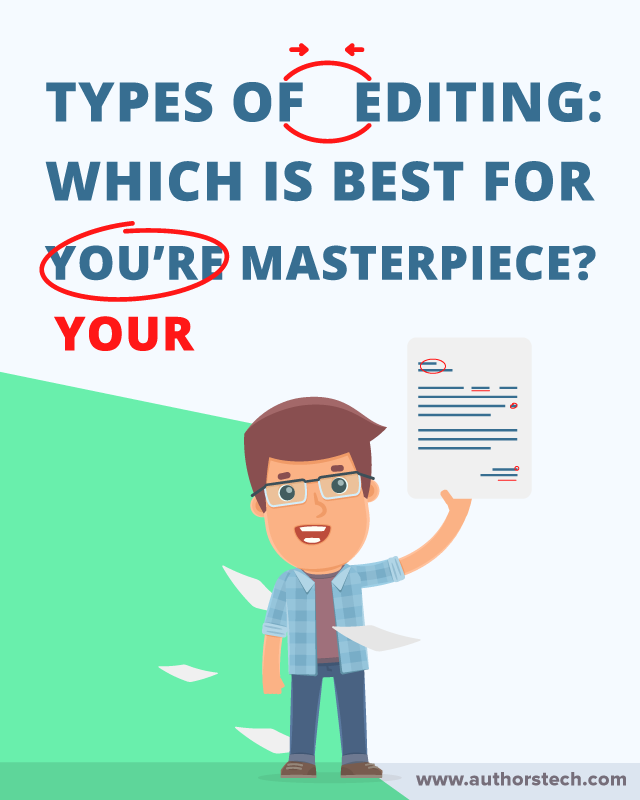 >> Types of Editing: Which is Best for Your Masterpiece? Have you ever been immersed in the world of the book you’re reading. Lost in its characters. Sucked into the drama. Totally immersed in the journey. Only to be abruptly thrown out of the world due to a typo? Typos not only break the reading experience, but too many of them can erode your credibility as well. But, beyond the copyediting and proofreading that will help you avoid the fate above, there are a handful of other types of editing as well. No matter if you’re writing fiction or non-fiction, there’s a multitude of different editing types you’ll want to be aware of. As an author, you want to create the best possible reading experience, and part of that is utilizing the various types of editing you have at your disposal. Depending on your writing level you may only need to use a single form of editing before you publish. Below you’ll learn why editing is so important, the different types of editing available to you and when you should use them, plus some ninja tips on finding the best editor for your needs. Handing your book over to an experienced editor is a great idea, especially if you’re early on in your writing career. Maybe you’ve finished your book and sent a few copies over to family and friends. They’ve read it and told you it was great! Now, this very well might be true. But, if you’re really looking to improve your book, you’ll want an unbiased person to look over your work. You want someone who won’t hold back. A good editor will be ruthless. Not in an attempt to be mean, but instead as a means to elevate your book to the highest level. Writers often have lifelong relationships with editors. Every professional writer understands the importance of improving their craft. By hiring an editor you’re paying for an education: a single book edit can help improve your writing much faster than trying to go at it alone. At a certain point you’re just wasting time with revisions. Yes, you want your book to be perfect. But, constant rewriting and endless drafts can turn into a means of procrastination. Instead of spending all this time trying to perfect your book, you can hire an editor to shortcut the process for you. With a fresh perspective, you’ll be able to quickly see errors in your work, and things you may have overlooked. Fix these and you’ll be ready to publish. Your author reputation rests on the quality of your work. Publish a book with plot holes, typos, and grammatical errors and your readers will never forgive you (and butcher you in the reviews). It’s your job to deliver the best reading experience possible. This will not only lay the foundation for a successful career, but your readers will thank you for delivering a stellar reading experience. When you think of editing, you probably think of someone combing your book for embarrassing typos. But, as you’ll soon learn below, there’s a lot more to it than that. The editing process is nearly as valuable as the actual writing process itself. Like you learned above, having a solid editor behind you can help to greatly improve the quality of your work for the rest of your writing life. Below you’ll find the four most common types of editing, why you’ll want to use each one, and what the process generally looks like for each. Developmental editing takes an in-depth look at the structure of your book. Think of an edit that deals with the big picture impact you’re trying to make. It usually doesn’t involve any typical changes you’ve come to associate with editing like grammar corrections, typos, etc. But instead, you’ll get feedback on if your book works or not. If you’re a fiction author this style of edit will typically illuminate any plot holes, inconsistencies, cliches, or character weaknesses. If you write non-fiction, then it’ll point out any big issues, places you need to go deeper, irrelevant sections, and more. A developmental edit can generally be very useful for author’s who are just starting out. This will help you to improve your skills, become aware of any mistakes you tend to make, and give you feedback that will elevate the quality of your work. What is the Development Editing Process Like? A developmental editor will work with you side by side to help refine your early manuscript. Some author’s even prefer to get a developmental edit done when they’re in the outline stage of their book. This has the advantage to being much cheaper, faster, and will help you save time as you’re not wasting time writing words that you’re going to cut out later. Still, if you’re getting a developmental edit done, expect to go back and forth with an editor answering big picture questions about your book, answering comments, rewriting scenes or entire sections, and doing other large scale changes. This process can be pretty time consuming, depending on the length of your book, and how much rewriting or re-structuring needs to be done. A structural edit is similar to the development edit above. But, instead of just giving general feedback, there’s generally some tangible edits involved. Here you’ll be bringing your book into alignment with the intentions you’ve set out to achieve. For example, does your book effectively speak to your target market? Does it hit the goals you’ve set out for yourself? Are there any weak points in your book? Are there new sections or chapters you could add? Does the book need to be rearranged in a more logical or compelling manner? A structural edit will bring all of this to life with tangible edits from your editor. Typically, you’ll find that a lot of book sections can be cut, or you’ll get recommendations to add more chapters, or go more in-depth into other sections. Here you’ll be getting physical edits that will improve the structure of your book, make sure you have consistent voice and tone, give recommendations of elements that need improvement, and a lot more. This style of edit is generally more expensive than a strict developmental edit, as it’s essentially an applied developmental edit. But, you’ll walk away with a much stronger book because of it. What is the Structural Editing Process Like? The process of structural and developmental editing can be similar depending on how the editor chooses to define the process. In some cases a developmental edit may look like a structural edit, while other times a development edit will result in a single document that offers large-scale feedback. A typical structural edit will take the birds-eye view of a development edit, but focus more on the individual scenes, chapters, characters, and more. Copyediting is also known as line editing. Some editors will make a distinction between line editing and copyediting. Make sure you clarify your editor’s definition of a copyedit before you move forward. Overall, a copyedit will focus on the readability of your work. It will help to ensure your work flows smoothly and there are no glaring errors. Instead of taking a birds-eye view of your book (like a structural edit), this type of edit will focus on your book on a paragraph and sentence to sentence basis. This alone won’t improve the structure of your book, but instead make sure the text is as readable as possible. So, you’ll get changes like how you should rework certain sentences or paragraphs to improve their readability, sentence flow, along with standard spelling, grammar, and punctuation checks. Copy editing is one of the most common forms of editing. If you’ve already gone through developmental or structural edits, then this type of editing will help to elevate the quality of your words. What is the Copyediting Process Like? The copyediting process is similar to those above. Typically, you’ll send your editor a Word document and they’ll use the track changes feature to make suggestions and edits all over your manuscript. Naturally, you won’t agree with every change the editor suggests. But, it’s important to spend time with every comment or suggestion. After all, you paid for the time and experience of a professional, so their advice should mean something to you. The final type of editing is known as proofreading. This essentially acts as an advanced form of spell-check. Now, there are some advanced editing and proofreading tools out there that can do a decent job of this. In some cases, these can take the place of a proofreader. But, if you’re publishing a book and want to put your best foot forward, then a human proofreader can be a worthwhile investment. This type of edit will only check for spelling, grammar, and punctuation errors, along with correcting all of your typos. However, it’s not the best idea to submit your work directly to a proofreader, as this can lead to having sentences that are grammatically correct, but don’t make sense in the context of your book. What is the Proofreading Process Like? As the final part of the editing process proofreading usually takes place once your book is in its final form. Meaning the digital and/or print layouts are complete. At this stage you’ll present your editor with a PDF and they’ll make any final suggestions and tweaks to your book. This used to occur with a final printed version, however the speed of today’s writing and publishing climate has transitioned to mostly digital PDFs. Implementing these edits hopefully won’t take a long time, especially if you’ve already gone through multiple phases of editing. Mechanical editing is a more niche form of editing whose goal is to make sure that your work adheres to a specific style, such as Associated Press Style, or The Chicago Manual of Style. The type of edit will ensure that your work follows all the specified rules of your desired format. In some cases, this level of edit will also include a copyedit, since the editor is already looking at your work on a word-by-word basis to ensure it meets the necessary standards. If you’re using quotes, references, or telling stories about other people in work, then a reference edit, or fact check could be a great idea. This type of edit is exactly what it sounds like. An editor will check all of your facts and references for accuracy. This will help to ensure you’re not miss-quoting anyone, improperly attributing a story to another person, and so on. This can be especially valuable for non-fiction authors who are referencing studies, books, or case studies in their work. However, this can be applied to fiction books as well, ensuring the accuracy of locations, characters, and making sure everything in your book remains consistent throughout. The type of editing your book will require mostly depends on your experience as an author. For example, if you already have a few books under your belt, and you’ve already worked with a developmental editor for those, then you can probably skip the higher up levels of editing. While if you’re just starting out you could greatly benefit from all four of the main types of editing. Think of this as an investment in your skills and future success as an author. Beyond your writing experience, you’ll also want to take a look at your specific strengths as well. For example, if you’re skilled at outlining books in a logical fashion, or have serious chops in story architecture and can craft a compelling story and character arc, then you may not need a developmental edit. But, if you struggle with grammar or sentence flow, then it’ll probably make sense to bring in copyeditor. Editing isn't expensive. It's an investment in your author career! Keep in mind that most authors can benefit from a proofreader. This doesn’t always have to be an actual editor, but can be a group of friends, peers, or beta readers who enjoy books in your genre. The more eyes you can get on your books, the better. As a writer you’re so familiar and intimate with your manuscript that it’s easy to overlook the most glaring errors. Finally, it’s important to view editing as a long-term expense. For your first book you’ll probably pay a lot more for editing, but this educational process will help to uplift your craft, so you’ll need to invest less and less with each successive book. ​Have you taken your book to the highest level you can? Do the tiny improvements you’re making feel like procrastination? Have you gone through a round of self-editing? Do you feel like your book just isn’t working? Do you have a budget to hire the right editor for your book? Consider why you want to hire an editor in the first place. Are you seeking validation from an experienced professional? Or, do you truly feel that your book is ready and an editor can help take it to new heights? Once you know what kind of editing your book requires, it’s time to find an editor. Your search for the perfect editor will depend upon two things: your budget and the type of editing you require. It’s also important to look for an editor that has experience editing the type of book that you’re writing. Different genres have different conventions, so you’ll want to find an editor with experience editing books that are similar to yours. There are multiple approaches to finding the perfect editor for your needs. This approach works best if you read a lot of self-published books, or books written by indie authors. Usually in the dedication pages, or early in the front matter you’ll see a sentence or two about who edited the book. Sometimes this information can be at the back of the book. Then, once you’ve found the editor, find them online and reach out. You can also get in touch with the author to see who edited their books as well. Spend some time browsing through the above sites until you find a handful of editors that are worth reaching out to. If the two above steps don’t work then you can turn to online platforms to find your dream editor. One of the most popular is Reedsy. This website has all kinds of publishing-related professionals you can hire to edit your work. The site is also very intuitive and you can see some of the past books that they’ve edited, or the genres they specialize in..
Can’t I Just Self-Edit My Own Work? This is a question that comes up a lot. And the answer is, it depends. Once again, your existing skill set and strengths come into play. Along with home many books you’ve published before. If you’re operating on a small budget, then there are some alternatives. For example, the book The Story Grid by Shawn Coyne, can be a great tool to help you diagnose and fix any structural errors in your book. There’s also the book called The Little Book of Self Editing, which will walk you through the process of editing your own work with a critical eye. It’s also always a good idea to use beta readers too. These are either people in your network, other authors in your genre, or readers on your email list. You’ll send them a copy of your book that’s nearly finished and they’ll offer you feedback. Usually, you’ll get a mix of feedback that ranges from structural issues, points where your book didn’t flow, and grammatical errors. Finally, you have the option of using editing software: there are a ton of different programs you can use, all packed with different features. Most of them act as improved spell-checkers, but the paid versions of the tools can offer you a lot more. Including pointing out common writing mistakes you make, and ways to make your writing flow smoothly. Overall, it’s hard to beat the value of a skilled third-party editor. But, there are ways around it if your budget doesn’t allow for an editor at this time. As you can see there’s a lot going on in the world of editing. Hopefully, you have a better understanding of the different types of editing available to you, and a roadmap for choosing the best kind of editing for your needs. Finally, working with a great editor should be seen as an investment in your education and skills. The faster you improve your craft, the better books you’ll write, and the sooner your career will take off. Any questions about choosing the best type of editing for your needs? Ask away in the comments below.